This was the first line in an email we all received in early May. The response was long awaited, but nothing could prepare us for the excitement looming ahead. Our intellectual journey into the world of journalism started early. Azza, our program coordinator, bombarded us with an array of articles and probing questions in emails leading up to the week of the program. Our anticipation continued to grow. When we first met, we began to put faces to names. Upon arrival, we conducted interviews with Princeton residents on their opinions of New Jersey Governor and GOP presidential candidate Chris Christie. The following days were a medley of workshops, guest speakers during meals, and getting to know our counselors and peers. After learning the basics of journalism, we took to the field to use our skills. We wrote reviews of movies and campus plays; we covered a baseball game; we conducted an investigative report. 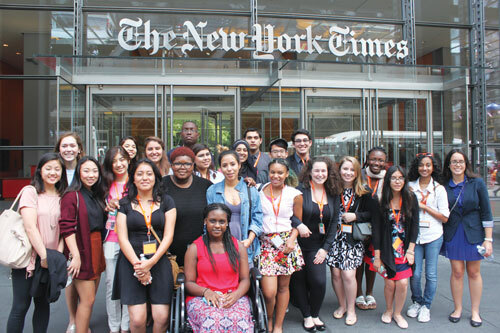 On our trip to New York City, the first visit for many, we toured the offices of Bloomberg, TIME, The New York Times, and The Daily Beast. These experiences in writing were invaluable to us as students interested in journalism. Our time here was also enhanced by intellectual debates. The guest speakers piqued our interest in many subjects, and it was eye-opening to be around opinionated and eloquent students. The diversity of the students brought many out of their comfort zones, and allowed us to see the world from a different viewpoint. The time between workshops and meals was spent in each other’s company. We were genuinely immersed in the activities of the day and in each other, especially because we did not use our cell phones. Early in the program, we were placed into the shoes of actual journalists. The late nights and early mornings paralleled the experiences of many of our counselors who work as professional journalists. The long days allowed for multiple workshops, and our note taking skills were improved by the fast-paced interviews that we conducted without the use of recorders. As tiring as the program was, we wouldn’t trade the experience for anything. These ten days have come to a close, but the memories will last long after the program. Over the course of the next year we look forward to working with our counselors during the college process. We would like to thank Azza, the directors, and counselors of the program for their instruction and support, and the generous donors who provided us with the financial possibility. We hope this program will continue to inspire classes of journalists after us. This entry was posted in Staff Editorials and tagged SJP2015 on August 10, 2015 by pusjp.